We were born in January 1998, when Gloria Ulterino, then head of the Roman Catholic Diocesan Office of Women in Rochester, New York, called together a small group of women. She dreamed of creating liturgical dramas that would lift up the voices of women in Scripture and Tradition through story, song and liturgical dance. For women are everywhere to be found in Scripture; and yet, we don’t know many of them. They are everywhere to be found in our Tradition; and yet, they often remain invisible and unheard. So, then, if we- men as well as women- aren’t aware of our rich ancestry, how can we fully lift up our own voices? Essential to this dream is careful research of the women we present, being faithful to the best of contemporary scholarship. Creativity is the other partner, allowing people to be drawn into the stories told. In this way, the stories of the past will surely touch our own… drawing truth out of our lives today. Out of this dream and these humble beginnings a powerful ministry began to emerge. We came together, one by one, little by little, and shared our own stories. We began to consider whose stories might first be told… and what our name might be. That last part came easily. 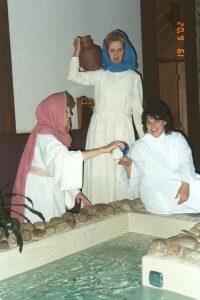 For “Women of the Well” would draw wisdom and knowledge… like water… out of ourselves, the people to whom we are sent, and our entire tradition. Along the way, we prayerfully wrote our mission statement, a good exercise, which assures our focus. From “Miriam’s Well,” our first endeavor, a number of programs have emerged… each with a different “feel,” a different focus, but always with a view of raising consciousness about the capabilities of women, then and now. And how we have grown! Both individually… and as a community. For we are truly a community of women who care deeply about one another and our ministry. And we bring to our ministry expertise in a variety of fields: theology, Scripture, writing, preaching, storytelling, art, liturgical dance, education, and general life experience. We have grown in numbers, as well. From our original small group, two remain: Marilyn Catherine and Gloria. Others have been drawn in and have remained, so that we now number twelve: Maxine Childress Brown, Jennifer Case, Lorraine Fusare, Deni Mack, Joyce McAndrew, Mary McGuire, Melissa Rice, Colleen Schantz, Richeen Smith, and Judith Stellpflug. And we are always open to inviting in newcomers. Each of our programs is a “favorite.” It just depends on the needs of our audience, as to which is most appropriate at any given time. And we continually create new ones. We also lead retreats and can offer larger or smaller segments, depending on your needs. Please feel free to contact us about our life-giving ministry.